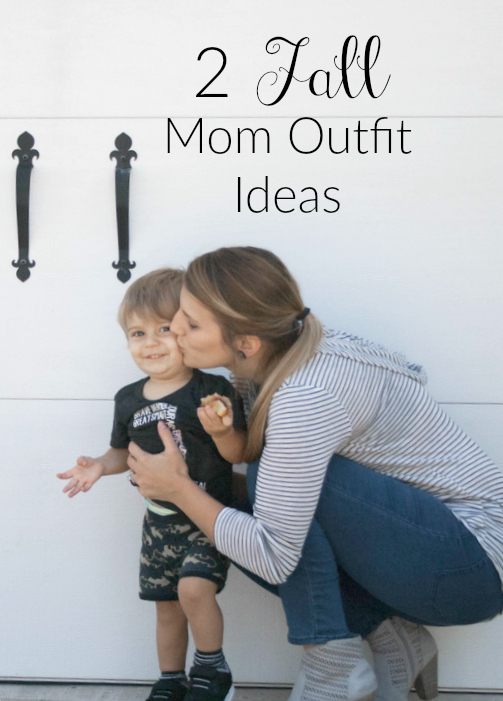 I am always looking for ways to be cute and stylish while also being an effective mom to my mischievous boy. It is a struggle to find and put together outfits that meet both of those criteria. I need to be able to run at a moments notice, so serious heels are no for me on a daily basis, and I need clothes that are flexible and comfy. I've put together two of my favorite looks for this nice fall weather we have been having. They are both cute enough to feel nice picking your child up from school, yet also easy to play in or run around in. ​Hopefully these outfits inspire you to find some pieces that you can feel stylish and comfortable in! You will notice that in both looks I am sporting a pair of boots that you may have seen on my Instagram. I am short, so I like heels, but for every day use, I only wear ones like these with a nice thick heel that are comfortable. I have links to each item, however, if they aren't sold online, I have linked to the store where it was bought. Jeans: Beverly Ankle Jeans from Forever 21 - super flexible and comfy so these are the perfect jeans for running around in. And they are only $17! I love that these leggings look like leather but are still comfortable! If you can't tell in these photos, they aren't your traditional nylon leggings- They look and feel just like leather. They will help make an easy outfit stand out from all the rest.